SINGAPORE - The sharp falls in regional currencies threaten to hammer Singapore exporters already battling the effects of a slowing global economy. The Malaysian ringgit, the Indonesian rupiah and the Thai baht have all taken a beating in recent weeks, which is making shipments from those nations relatively cheaper while lifting the prices of goods from here. Malaysia, Indonesia and Thailand are among Singapore's top 10 markets for non-oil domestic exports so any softening in demand will be keenly felt here. The ringgit has been particularly hard hit, crashing 9.4 per cent against the Singdollar since the start of the year to 34.31 cents, while the rupiah is down 4.7 per cent to $1.0166 for 10,000 rupiah. While the baht is down only 1.7 per cent, currency traders say the bottom has not yet been hit, given that an ailing domestic economy may force the central bank to support exports. Demand is not there. Every month, the story is the same - exports to seven or eight of our top 10 markets shrink. OCBC ECONOMIST SELENA LING. Economists note that if there is any reason not to be worried about the damage of a stronger Singdollar, it might be that global demand is weak beyond currency sensitivities. "Malaysian products have become more competitive in the export market," said Mr Jimmy Soh, deputy president of the Singapore Food Manufacturers' Association. Malaysia earlier this month reported an unexpected pick-up in June exports. Singapore's exports of refined petroleum oils are also under pressure, since most of the demand comes from Malaysia and Indonesia. "This sector will most likely be hit by the currency depreciation in our neighbours," said UOB economist Francis Tan, who added that, except for China and Hong Kong, other top exporters have seen their currencies fall against the Singdollar. But DBS economist Irvin Seah said only a certain amount of trade can be diverted away from Singapore as most companies here export higher-value-added products such as electronics and semiconductor chips, where "there is still a technology gap between Singapore and the region". Singapore also stands to gain from cheaper imports. The country is a net importer from Malaysia and Thailand and a net exporter to Indonesia. The biggest risk is still China, Singapore's largest trading partner. Slower growth there made it one of the top contributors to a decline in Singapore's non-oil domestic exports last month. Mr Tan sees hope for the Republic when the United States begins its cycle of raising interest rates, probably next month. The Singdollar, like most Asian currencies, will keep falling against the greenback while the yuan may dip less after its heavy adjustment last week, he said. That will make Singapore exports cheaper. 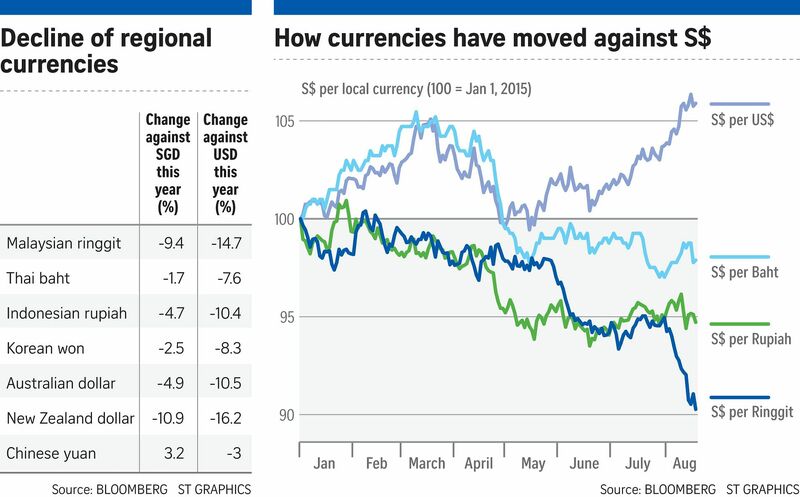 The Singdollar has fallen 13 per cent against the greenback over the past year to $1.4048. The prospects of higher US interest rates had already been prompting investors to pull out of regional currencies when China let its currency fall last week, a move that sent Asian currencies to new lows on fears that they would have to fight cheaper Chinese goods. Some currencies are still falling: Vietnam yesterday devalued the dong for the third time this year. Other central banks, including those in Thailand and South Korea, have also been vocal about using a weaker currency to boost their exports. But if there is any reason not to be worried about the damage of a stronger Singdollar, it might be that global demand is weak beyond currency sensitivities. "Demand is not there. Every month, the story is the same - exports to seven or eight of our top 10 markets shrink," said OCBC economist Selena Ling.